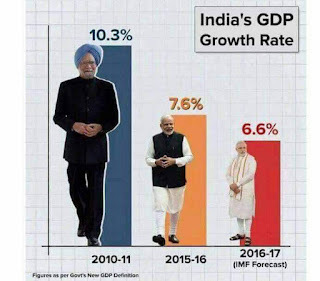 Is Modi or Manmohan Singh Better for Economy? Let the picture speak for itself as GDP has gone down drastically and we just pray to God that Demonetisation and GST gets requisite benefit for our economy and India once again knocks diuble digit growth. Only ray of hope is that income tax return filing individuals have increased by 25% which is a massive growth in a one year time span and credit for it goes to Modi govt. Check how GDP affects Job creation here.